For the first time since its 1996 debut, OZZFEST–the annual musical event that celebrates hard rock and heavy metal–has created a special one-night-only New Year’s Eve celebration to ring in 2019. 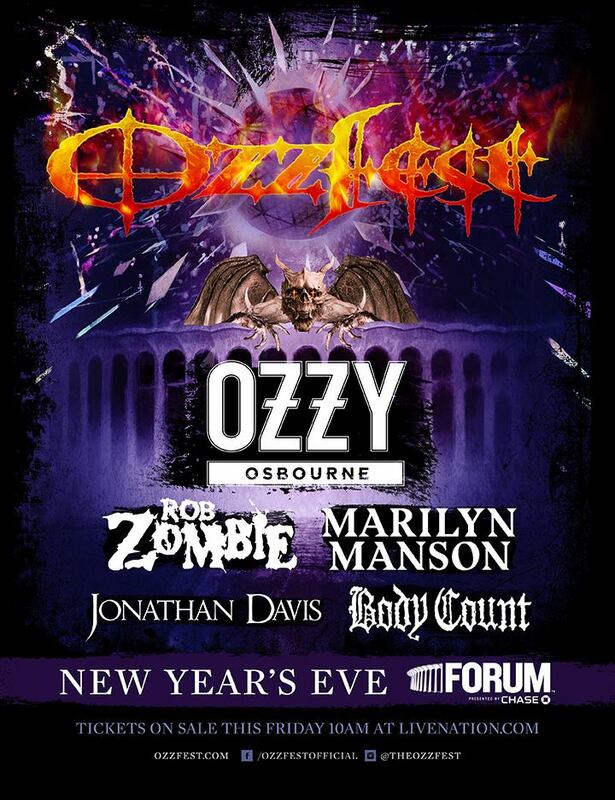 Set for Monday, December 31 at The Forum in Los Angeles, the event features headliner OZZY OSBOURNE and a line-up of some of the greatest names in rock (and OZZFEST alumni): Rob Zombie, Marilyn Manson, and Jonathan Davis (of Korn), along with the OZZFEST debut of Body Count featuring Ice-T. The New Year’s Eve party will include an outdoor stage, along with other holiday festivities, details of which will be announced in the coming weeks. The evening will conclude with OSBOURNE onstage counting down to the new year! “What better way to celebrate New Year’s Eve than with some of the greatest performers in this genre and our longtime friends Rob Zombie, Marilyn Manson, Jonathan Davis and Ice T,” says Sharon Osbourne.